Description: 8578 leads Train X747 westbound on the CSX Plymouth Subdivision near Okemos. Description: CP 8570-CP 8540 lead a northbound BNSF potash train thru Sumner WA. Description: Rail Camper Janice watches overlayed CP AC44CW #8578 at Binghamton yard as our bus was headen out. Description: Loram shoves back into the North Runner while CP 8578 is ready to do some switching. Description: This manifest has just got a new crew, and is waiting to depart Humboldt Yard. Soo 4512 is the bandit trailing. Description: An eastbound off the Elbow Lake Sub takes the switch into the yard at Glenwood West on a windy Saturday morning. 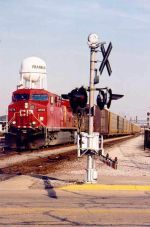 Description: CP 8578 is at Main Street with a westbound manifest.